Tonight, The Princess made dinner for us. Like seriously, I was her sous chef/handler of hot things, but she was pretty much in charge of dinner. Here’s how it started. This afternoon I decided the roads had probably thawed enough that we could head to the grocery store since we were now out of milk and strawberries – the two most important things at the House of Hills. The Princess then stated that she wanted to get some things at the store “herself” (that starts at 2 and never ends) because she wanted to cook. She then got a lecture on the fact that we were not going to waste food so that she could play with it and “make something up.” She doesn’t know enough about cooking to just throw something together that is edible so IF SHE WANTED TO COOK, SHE NEEDED A RECIPE. I thought that was the end of that….Nope. The Princess marched (literally) over to the cookbook cabinet and grabbed her copy of “Paula Deen’s My First Cookbook” (that I gave her Christmas of 2008), flipped to the dinner section, and announced that she was making stuffed shells for our dinner. Ever the flexible mommy (please insert laughter here), I agreed. 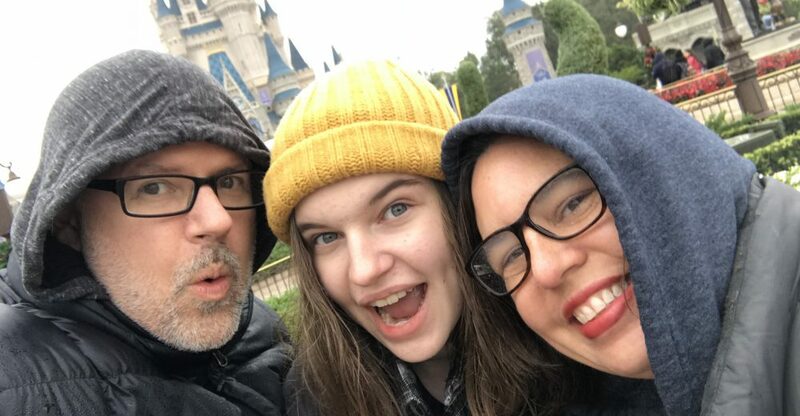 You see I had just done this post this morning about God and family time and using this snowcation to build relationships so I, um, needed to practice what I was preaching. I do believe she was slightly shocked that I agreed. We looked over the recipe and discussed what we had on hand and what we needed to get at the store. The original recipe did not call for any actual meat so I suggested that we add some sausage for Daddy. Anything for Daddy, so sausage got added. We jumped (well slid a bit really – ice you know) into the car and headed to the grocery store. The Princess brought her cookbook with her so she wouldn’t forget anything. Once we arrived at the grocery, The Princess announced that she was going to get a basket, gather her things, and meet me at the checkout. Um, NO! We then had a discussion lecture about how I loved her too much to allow her to go willy-nilly throughout the grocery store. Someone would steal her, I would be sad, and there would be no dinner. After a short pout, we moved on with our shop. WHAT A GREAT AFTERNOON we ended up having. While shopping for the things she needed to make dinner, we had amazing conversations about brand differences, price differences, where to find certain items, what Daddy likes to eat, what Mommy likes to eat. She listened intensely and soaked it all in. I was in awe of her attention. Once we got home, we unpacked the groceries and planned out the rest of the afternoon based on the time she wanted to serve dinner. The Princess didn’t pick the easiest recipe to do. 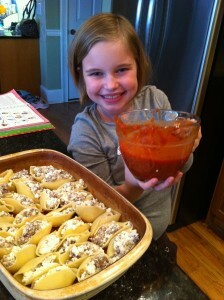 Stuffed shells has multiple steps involved. First we browned the sausage. I will admit that I did a good bit of this part. It was hot and hard for her to do. Then, we cut coupons for awhile until it was time to boil the shells. While the shells were cooking, we mixed the filling. Then, she assembled (with only a bit of help from me), and we put it into the oven to bake. It was delicious! Of course, it was Paula Deen so that was a bonus. My Sweetie and I enjoyed it very much. 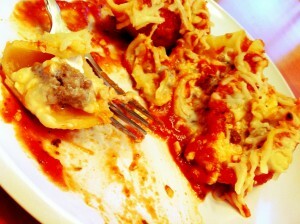 Even more amazing, The Princess ate one of the stuffed shells. Like, an entire shell. That is AMAZING!! She is the pickiest eater out there. In fact, she hadn’t planned on eating any of what she was cooking. 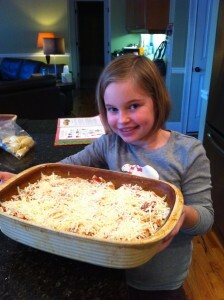 She was cooking for Mommy and Daddy. She didn’t think she’d like it. I was so proud of her for trying it. Then, she ate the whole thing. AMAZING! And, we discovered she likes plain cottage cheese. Who knew! I’m going to bed one very proud mama. Proud of my girl for cooking for the family. Proud of my girl for trying something she seriously didn’t think she’d like. Proud of my girl for growing up and becoming the amazing young lady I know God has planned. It’s days like these that I want to hold onto. I want to remember the look of accomplishment on her face when she placed the dinner plates on the table. I want to remember the joy on her face when Daddy pronounced it delicious. I want to remember it all. Next week, she’s making Chicken Pot Pie. Can’t wait! Preheat oven to 350. Boil shells according to package directions. Brown sausage. Mix sausage, cottage cheese, and Parmesan cheese together in a bowl. Add red pepper flakes and Italian seasoning to spaghetti sauce. (Basically season it to your liking.) Spread a thin layer of sauce on the bottom of the pan. Stuff shells with a heaping teaspoon of cheese mixture and place them side by side in the dish. Cover the shells with the rest of the sauce, and then sprinkle the mozzarella cheese evenly over the top. Bake for 25 minutes or until the mozzarella is bubbly and brown. Allow to cool for a few minutes before serving. This entry was posted in Cooking, The Princess by KHill. Bookmark the permalink. Proud of the Princess’ mommy! What a great story. I know you must be very proud of her. 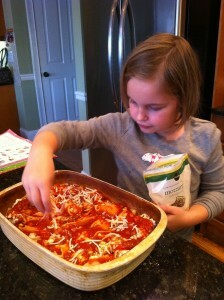 Hard to believe she’s old enough to be reading and cooking on her own (basically). I remember when you all came to visit Kristy in Savannah and Maggie was only 2 or maybe even younger. Can’t wait for the Chicken Pot Pie recipe next week. Good for you!! I’m so glad you shared this story. It’s a great reminder for me to let Annalyn help and do and be a little person (instead of a baby). That is soooo hard, but most of the time, sooooo worth it!